In Qt 3D, the framegraph is the data-driven configuration for the rendering. We implement the framegraph in the ShadowMapFrameGraph.qml file. Any path from the leaves of this tree to the root is a viable framegraph configuration. Filter entities can enable or disable such paths, and selector entities can alter the configuration. The actual passes are not defined here. The framegraph simply modifies its configuration when a given pass is rendered. The second pass is more straightforward, because we simply render to the screen using the main camera. The bulk of the magic happens in the AdsEffect.qml file, where our main Effect entity is defined. 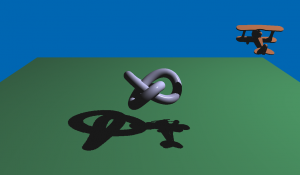 It implements the Ambient, Diffuse and Specular (ADS) Lightning Model Phong shading with the addition of shadow mapped generated shadows.